Sir Alexander Fleming was one of the most influential scientists of his time. He is best known for his Nobel Prize-winning discovery of the antibiotic penicillin in 1928. Penicillin has saved about millions of people’s lives. Fleming was born in Scotland on August 6, 1881. He completed a course at St Mary’s Hospital Medical School in Paddington, London. After which he joined the research team at St Mary’s where was the assistant to a bacteriologist, Sir Almroth Wright. 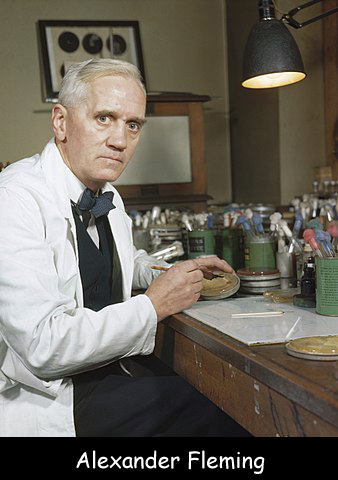 Alexander Fleming has received his licentiate from the Royal College of Physicians in 1906 and then he joined the Inoculation Department. Fleming served as a member of the Territorial Army from 1900 to 1914 in the London Scottish Regiment. He also served in battlefield hospitals when World War I broke out. In 1928, he was appointed as a professor of bacteriology in 1928 at the University of London. He was knighted as Knights Bachelor in 1944 and became Sir Alexander Fleming. Fleming also worked in a shipping office for four years in his initial days. He studied the different properties of a strain of staphylococcus bacteria. He used to leave bowls with bacteria cultures standing by his worktable and this led to his discoveries. Ernst Boris Chain and Edward Abraham discovered how to isolate the penicillin and increase its potential. This is the reason why they shared the Nobel Prize with Fleming which was awarded in 1945. Fleming also demonstrated that antiseptic agents were only useful in treating superficial wounds, but were harmful when applied to deep wounds. Declan, Tobin. " All Alexander Fleming Facts for Kids ." Easy Science for Kids, Apr 2019. Web. 26 Apr 2019. < https://easyscienceforkids.com/alexander-fleming/ >.